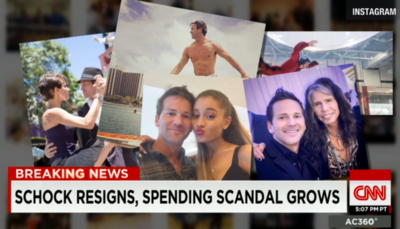 According to reports today, 33-year-old Rep. Aaron Schock's sudden decision to resign will not end federal investigations into his alleged misuse of campaign funds. 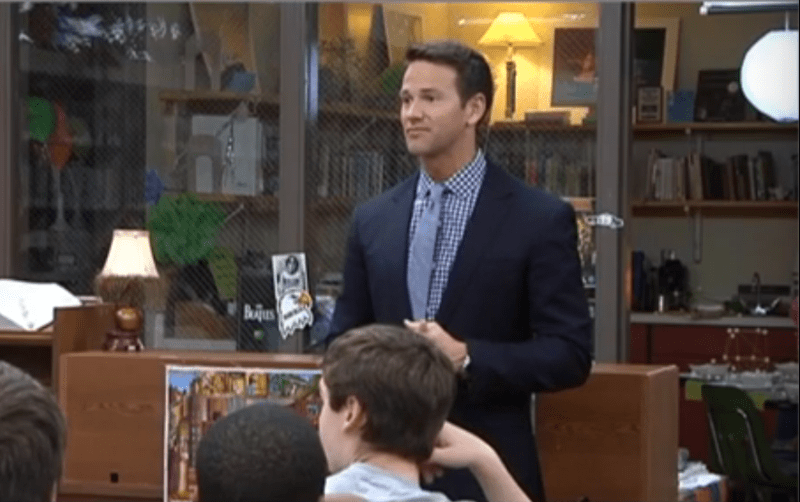 Schock, seen above either speaking to young supporters or appearing in an episode of How I Met Your Mother, first came to national attention after he spent $40,000 of taxpayer money to decorate his office so it looked like a Downton Abbey set. He denied this, or at least he claimed that he personally had never seen the show. Others have seen it, though, and more importantly, this cost $40,000 of taxpayer money. Ultimately Schock agreed to pay the money back. He has also apparently been frolicking around doing lots of stuff other than governing, such as appearing with celebrities, fake-skydiving, and flexing his abs, and he was even seen wearing a fedora in Rio de Janeiro, for Christ's sake, although to be fair if I were forced to choose between that and one of those Something about Mary haircuts I'd pick the hat in a New York second. Basically what I'm saying is how did I not notice this buffoon until just now? The federal investigations are focusing on the mileage reimbursement, travel that may have been paid for by campaign donors, and other gifts that were not reported. Understandably, the congressman's father expressed support for his son, and so Politico's headline quote, "two years from now he'll be successful, if he's not in jail," is probably not quite what he meant to say. Presumably because Schock is not a Democrat and not a senator, Democratic Senator Nancy Pelosi took the opportunity to comment. Her view: the scandal shows that members of Congress, their families and their staffs should undergo more rigorous ethics training so that (and this is Politico paraphrasing) "all parties are fully aware of the differences between personal, campaign and official spending." Yeah, that'll do it. Also some math training, I think, so they are fully aware of the differences between 80,000 and 170,000, or really any two such numbers where taxpayer money is involved. You're right: I should know Nancy Pelosi isn't a senator, especially because she's my representative.